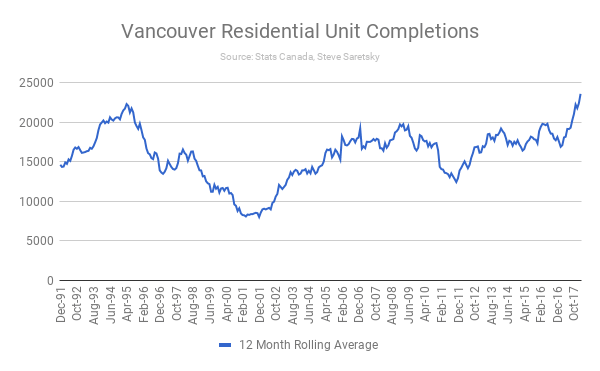 Amidst a slowing Vancouver Real Estate market which witnessed the detached segment register a twenty seven year low in sales for the month of March, the Vancouver condo market appears to be undergoing a cooling of it’s own. Vancouver condo sales trickled in at just 508 sales for the month, it’s lowest total since the year 2013. It was the second annual decline and a 43% decline from it’s peak in March 2016. However, despite the obvious slowdown and decline in buying activity, multiple offers remain consistent. A total of 48% of Vancouver condo sales sold above the asking price in March, an 11% jump from the year prior. 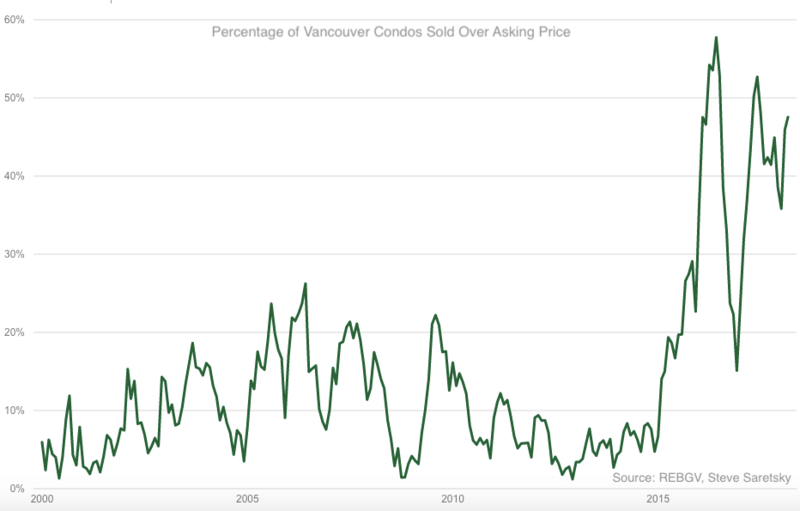 Percentage of Vancouver condos sold over asking price. This is a result of listing inventory still stuck at crisis levels. Total inventory for sale sunk 16% on a year over year basis. It appears fewer buyers are chasing less supply, particularly at the entry level, where 58% of one bedroom units sold above the asking price. Luckily for condo buyers, relief is on the way. Completions of new construction condos are ramping up. The twelve month rolling average of unit completions hit a record high in February of 23,623 units. Purchasers of these units, who are rarely end users, will be testing the re sale or rental market as they complete. This should provide some much needed relief to buyers and renters alike. A continued decline of condo sales combined with a record high completion rate should help to replenish inventory levels. Until then it remains slim pickings.